Last week, Google introduced a much improved set of integration for app indexing in the Google Search Console (formerly known as Google Webmaster Tools). With that, it seems the weekly emails Google has been sending webmasters who deployed app indexing as stopped. 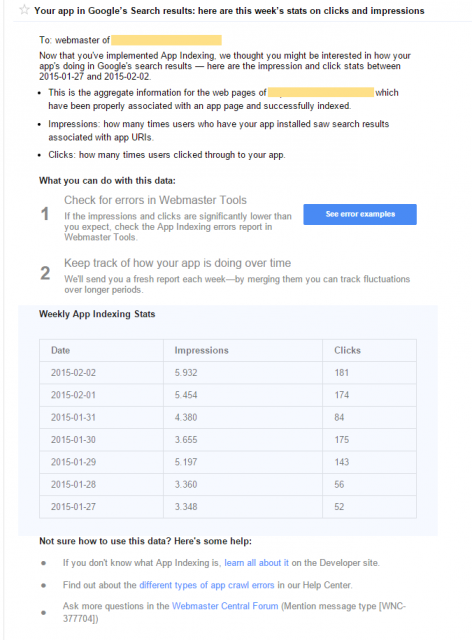 The weekly emails gave app developers a snap shot on their clicks and impressions from Google's search results, into their apps. I guess Google felt the emails were redundant to the new interface for reporting on this data within the Search Analytics reports? A Google Webmaster Help thread has app developers complaining the emails are no longer being delivered. For the past couple of months we have been receiving the weekly 'Your app in Google’s Search results: here are this week’s stats' messages in Webmaster Tools, but it was due to come on Thursday and haven't received it yet. Again, I suspect it has to do with the new reporting engine for app indexing in the Search Analytics report. Update: This is not confirmed, Mariya Moeva from Google confirmed on Google+ saying "Indeed +Barry Schwartz​, now you can get a lot more detailed statistics by adding your app to Search Console."